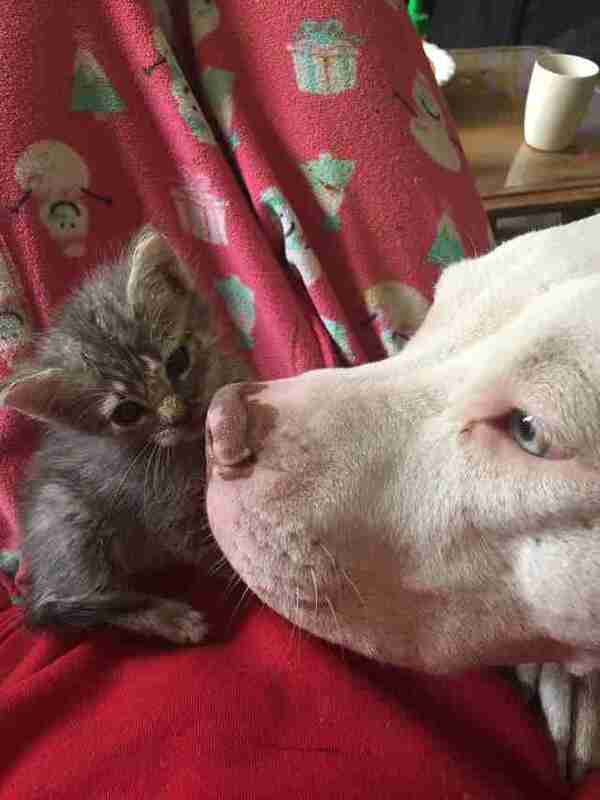 "Who would have thought a stray D.C. pit bull with scars on her face would be a good kitten mother?" 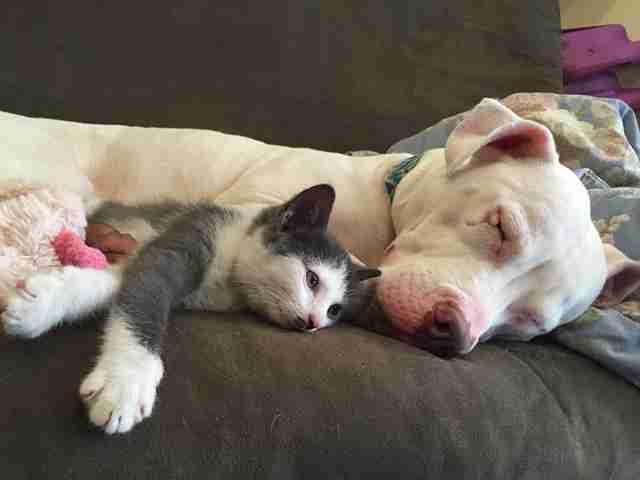 Marissa Clingen's first foster kitty was an adult cat, who basically avoided Hema, the resident dog. 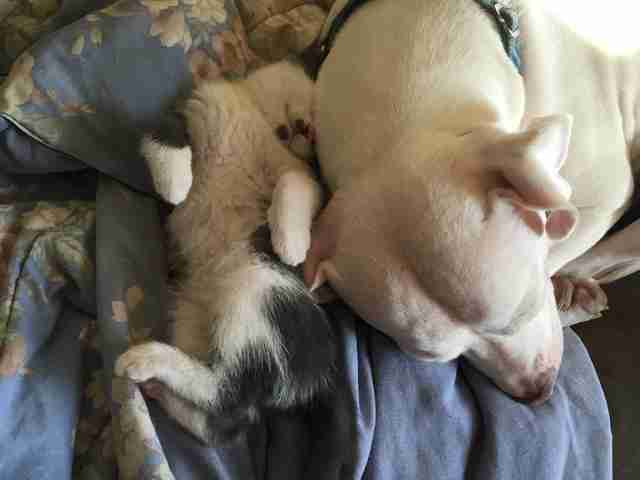 So it was impossible to know that this pit bull would turn out to be an utterly devoted kitten-tender. Three years and some 20 cats and kittens later, Clingen knows: Hema loves kittens. She loves kittens. 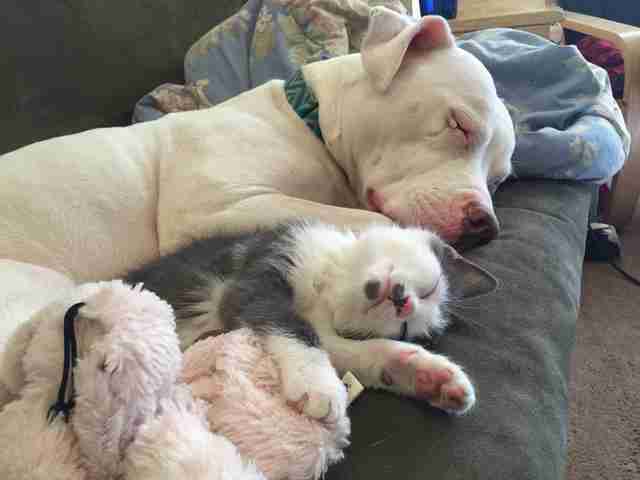 She loves to kiss them and sleep with them and just to be near them at all moments. She doesn't even complain when the kittens bite her ears, which - being as they are basically floppy cat toys - they always do. "All she wants to do is lick and snuffle them," Clingen tells The Dodo. 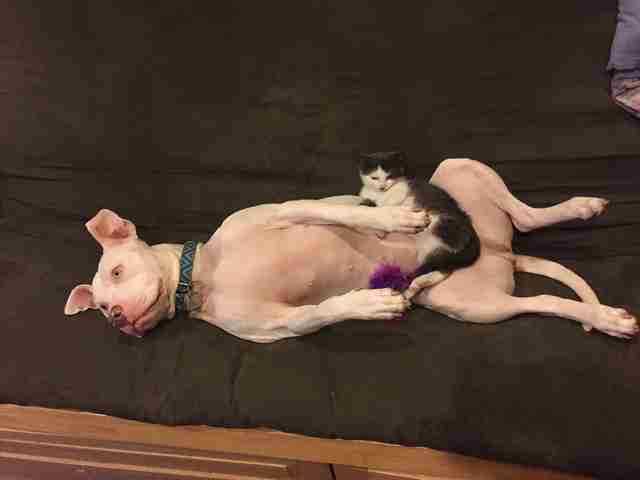 "Who would have thought a stray D.C. pit bull with scars on her face would be a good kitten mother?" Indeed, a few years, ago Hema landed in Washington, D.C.'s, city shelter - then called the Washington Humane Society, now the Humane Rescue Alliance. "She was found as a stray but had many, many bite wounds," spokesperson Alix Tolley tells The Dodo. Even then, with what was likely a very rough past, Hema was very sweet. So sweet she wagged her way into being adopted, when Clingen and her roommate, Robin Seegers, swung by the shelter one day in 2013, "just to look," Seegers says. "Hema started putting her paws under the kennel gate and nibbled Marissa's finger. We took her out to meet her, and just looking turned into me filling out paperwork and going to buy a collar and leash!" 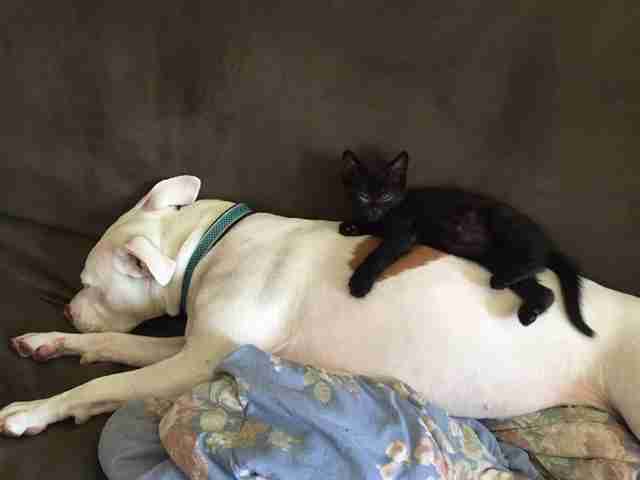 Obviously, Hema is darling with more than just the kittens. Seegers - Hema's official mom - says she's a "very playful and cuddly" dog, who likes sneaking onto people's laps and giving lots of kisses. 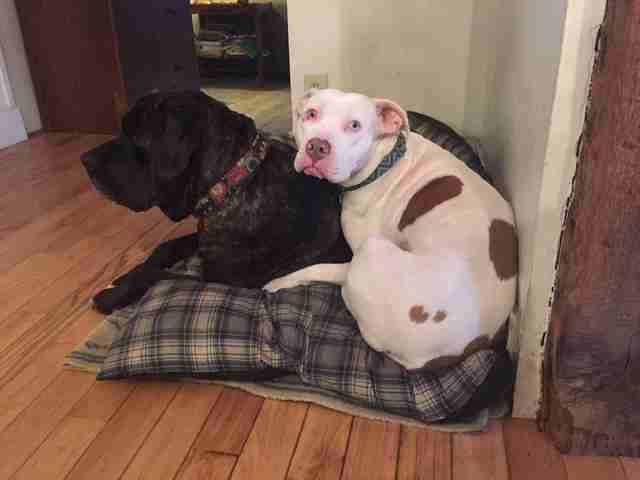 "Hema doesn't have much of a sense of personal space," Seegers says. 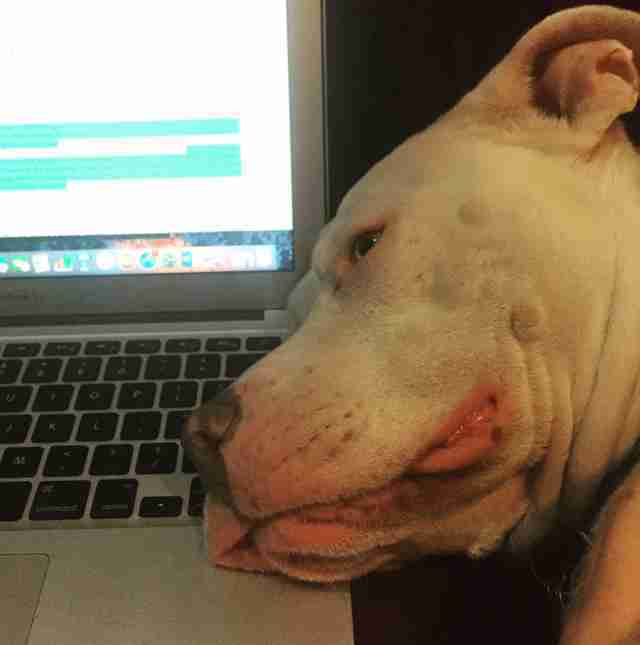 "She also likes to 'help' me type, by planting her pink lips on my laptop." 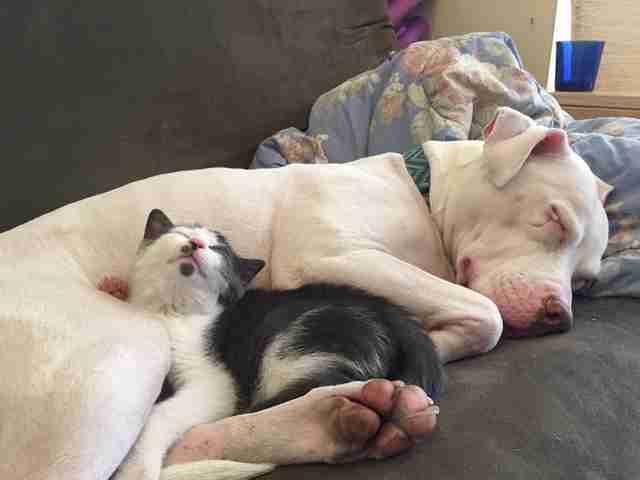 Hema lives to love, whether it's kittens, humans or fellow dogs. With the kittens, her extreme affection has an added bonus: It helps them get socialized and learn how to live in a home, so that they will be extra-ready when it's time to find their own families. There are some kittens the humans and the Hema have gotten especially attached to. Clingen recalls Muffin - a sick little one who for a spell seemed like he might not make it. He made it, thanks to Clingen's and Hema's round-the-clock care. "Hema would lick his pathetic, crusty face and they would snuggle in her bed," says Clingen. "It truly brings tears to my eyes," says Tolley. 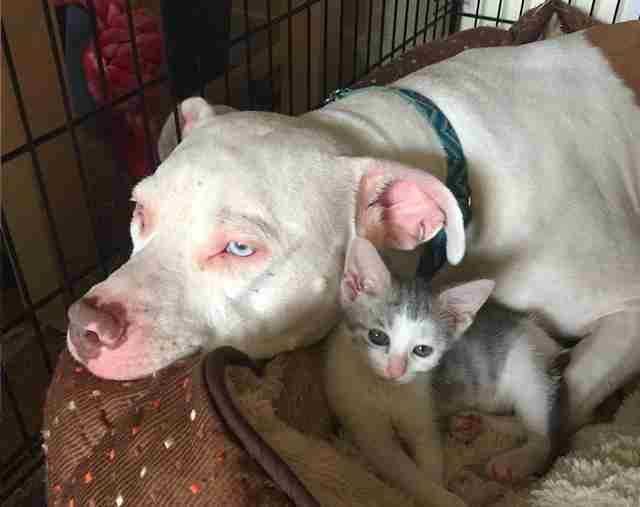 "The fact that she can still be so loving to those kittens shows the resilience of these animals." Clingen knows that bottle feeding the kittens, getting them medical care, teaching them how to live in a home, loving them to bits - then dispatching them to their adoptive families - are what it means to foster. Hard as that last part can be, for Hema or Clingen, it's essential - especially when living in a small city apartment, and wanting to be able to help even more. "It can be really sad to say goodbye," says Clingen. 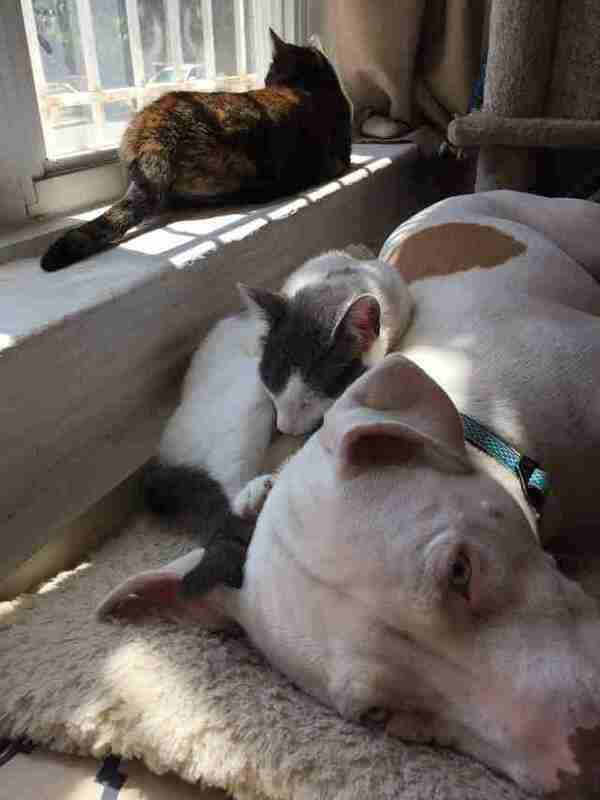 "I just try to remember where they would be if I hadn't fostered them." It's a really busy time for animal shelters. 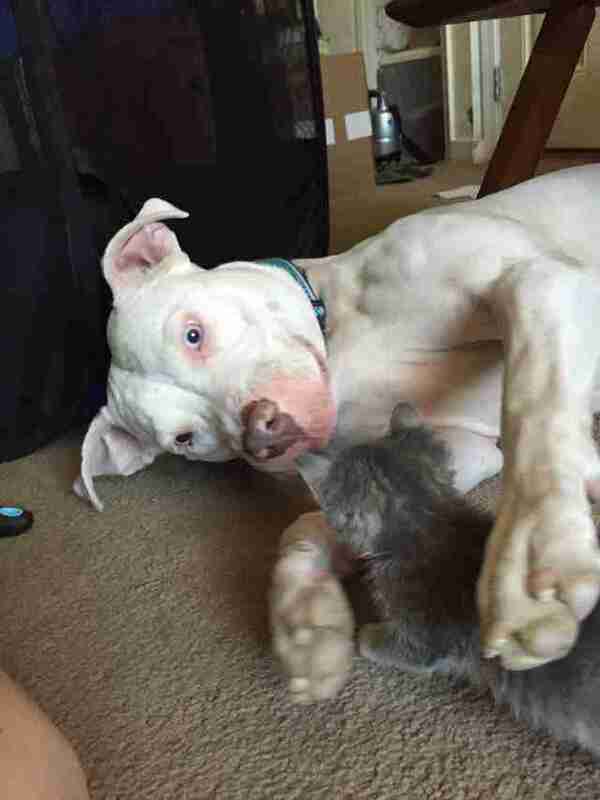 And utter bliss for one kitten-obsessed pit bull.